^ a b Salvaggio, Carl (2007). Michael R. Peres, ed. The Focal Encyclopedia of Photography: Digital Imaging, Theory and Application (4E ed.). Focal Press. p. 741. ISBN 0-240-80740-5. Schanda, János D. (1997). "Colorimetry" (PDF). In Casimer DeCusatis. Handbook of Applied Photometry. OSA/AIP. pp. 327–412. ISBN 978-1-56396-416-9. Bala, Raja (2003). "Device Characterization" (PDF). In Gaurav Sharma. 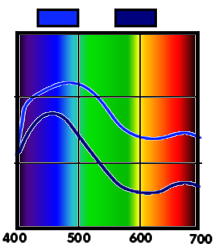 Digital Color Imaging Handbook. CRC Press. ISBN 978-0-8493-0900-7. This page was last edited on 20 September 2018, at 12:59 (UTC).